The event’s tradition can be traced back to the mid 16th century, when a young Turkish acrobat succeeded in walking above a rope tied from a boat in Riva degli Schiavoni (the waterfront in front of St. Mark’s square) to the Piazza’s bell tower, and finally to the Doge’s Palace. Upon his arrival to the Loggia Foscari of Doge’s Palace, the tight rope walker offered a tribute of flowers and gifts to the Doge. After carrying out the tradition for years, the addition of dove or angel wings strapped to the performer’s back was introduced, hence the name “Il Volo dell’Angelo” or “Flight of the Angel.” The tradition was interrupted when, in 1759, the acrobat tragically fell and crashed among a horrified crowd below. The event was stopped for a long period, after which a more safe version was reinstated. Today, the kick off event of Venice’s Carnevale involves a woman in traditional costume “flying” from the top of St. Mark’s bell tower to a stage on the opposite side of the square (strapped to a safety harness, of course). The “angel” is selected the year prior, as the winner of the “Festa delle Marie” costume contest is awarded the place of honor. This year, the 2015 winner Irene Rizzi was selected to fly above the crowds in Piazza San Marco, sprinkling confetti and gold “angel dust” to the masses below. The Carnival of Venice is one of the most known and treasured carnivals in all of Europe, if not the world. The Carnival season is so important to Venetians that the celebratory period begins earlier than in other cities. 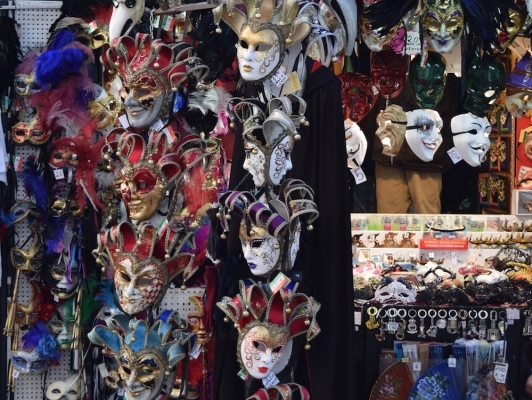 In Venice, the 2016 season kicked off on January 31, while most other cities will wait at least another week until Fat Tuesday (or Martedi Grasso in Italian), which this year falls on February 9. With its public festivities, costume filled streets and grand masked balls, Venice attracts tourists from all around the world. While the number of visitors varies from year to year, it is believed that nearly 3 million tourists travel to Venice during Carnevale. Originating in ancient times, the earliest written account of such celebrations in Venice was found in documents from Doge Vitale Falier (1094), which spoke of public celebrations and used the word Carnevale for the first time. The purpose of the holiday was to provide the population, especially those of the most humble means, with a period dedicated to festivities and merriment. The idea behind wearing masks and costumes was to allow a kind of leveling of social divisions, a time in which one’s social and economic status was concealed. While origins of Carnival can be found in other cities, most notably ancient Rome, the first official document declaring the Carnival of Venice was in 1296. In this year, the Senate of Venice declared the day before the beginning of Lent a public holiday. For centuries to come, Carnival was celebrated throughout the city, with elaborate parties complete with musicians, jugglers, acrobats, animal shows, dancers, and more. Today the tradition carries on, with visitors and locals alike enjoying the festive atmosphere in Venice.